Click Here for our Managing and Supervising Brochure! What does it take to make your business grow again? You manage or own a successful business, and coming out of tough economic times you’ve re-engineered, re-sized and re-invented your organization. Now you’re ready to hit the “reset” button. You are letting go of unrealistic expectations,resetting priorities and eliminating distractions. As a result of the opportunity for deep personal growth and new direction, you’re engaging differently with your suppliers, your customers, and your people. Your organization needs self-managed communicators who help individuals and teams analyze goals and make decisions, teach others to be leaders and build an organization that can sustain its success even when they are not around. 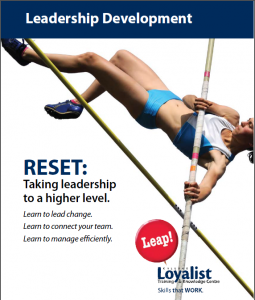 If you are ready for the Reset challenge, Loyalist Training & Knowledge Centre can help. Your company may be eligible for a rebate of up to 50% on your direct costs of training. Contact us for help applying.